NORWALK, CT – June 29, 2006 – The Health Care Mergers and Acquisitions Information Service won another prestigious award this month for “Best Database”. This top award was presented by the Specialized Information Publishers Association at the 30th Annual International Conference held this June in Washington, DC. 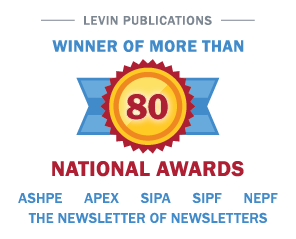 Over the past three years, The Health Care Mergers and Acquisitions Information Service and its sister publications have won numerous awards from many of the industry’s most prestigious organizations. “We were delighted to have received such a prestigious award in such a highly competitive online area. The health care mergers and acquisitions database has a distinct advantage over a more generalist business model, such as Thomson Financial Securities Data, since our researchers only cover one industry and cover it well. The mergers and acquisitions database was recognized as an effective way for our large Wall Street clients, such as Morgan Stanley and Merrill Lynch, to access highly specialized information anytime day or night. Not only does a subscription to the mergers and acquisitions database cost a fraction of the annual salary of a full-time analyst, but the quality of the data is fully guaranteed,” said Eleanor Meredith, the publisher of The Health Care Mergers and Acquisitions Information Service. Subscribers to The Health Care Mergers and Acquisitions Information Service enjoy special free access to the database. To sign up only for the database, visit our website. Registration is free; subscribers pay only for the detailed transaction reports they view and/or download. For more information, or to subscribe to the database, call 800-248-1668.